The San Jose Sharks are going to the Stanley Cup Final for the first time in franchise history. They eliminated the St. Louis Blues in Game Six of the Western Conference Final on Wednesday night. The final score was 5-2. The Sharks got goals from Joe Pavelski, Joel Ward, Joonas Donskoi, and Logan Couture in the victory, while Vladimir Tarasenko had his first point of the series with two goals for St. Louis. Sharks goalie Martin Jones was terrific, stopping 24 of 26 shots and coming up with some game-changing saves when the Blues applied pressure. Blues goalie Brian Elliot couldn’t put together the game he wanted, stopping 22 of 26 shots for a Game Six save percentage of .846. Head coach Ken Hitchcock tried just about everything to get his goaltending going against San Jose, but it wasn’t meant to be. The Blues had the edge in faceoffs and hits in Game Six, but the Sharks took advantage when they needed to and got into the dirty areas. Neither team could exact much on the power play, with San Jose going without a goal in three chances and the Blues unable to capitalize on their single man-advantage chance. But in the end, it came down to the Sharks’ skill and they were simply a deeper roster. The Blues were unable to contain San Jose and they were routinely outworked. It didn’t help that St. Louis was unable to secure great performances from the likes of Tarasenko. He registered just two points against the Sharks, both of which came in Game Six. The Blues are still seeking their first championship in franchise history and their first trip to the Stanley Cup Final since 1970. The Sharks will host either the Tampa Bay Lightning or the Pittsburgh Penguins in Game One of the Stanley Cup Final, which is set to commence on Monday. 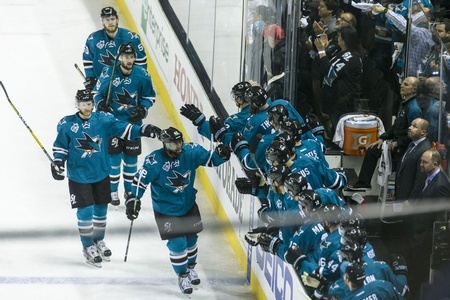 As has been well-documented, the Sharks haven’t had the best of luck in the post-season. They’ve made the playoffs in 16 of the last 18 seasons and are the second winningest team in the NHL since the 2003-2004 season, but the post-season has by and large been a debacle. They’ve been knocked out twice in the last four seasons by the eighth seed and blew a 3-0 lead to the Kings in 2014. Last season, they didn’t even make the playoffs. So it’s safe to say the Sharks have plenty to prove, which means they’ll be ready to face the opposition come Monday night.